No time to get complaicent! Where there are players, there's activity, and the new hub attracts everything from pelicans and travelling merchants to whirlpools and leviathans, which you can interact with for extra rewards. Some will be just for you, but others will require some teamwork. Who knows—perhaps you'll get lucky and catch a glimpse of the legendary sailfish, Arkaneo? You can catch a whole variety of fish using the new large net set up towards the hub's south end from Fishing level 68. Plus, some of our existing catches now take bait—including sea turtles, manta rays, and great white sharks. All you need to do is match the catch with the right bait, which you can make by cutting up magnetic minnows. Our new mechanic, Fishing Frenzy (level 94), will have you Fishing like never before. It’s a fun, hands-on method where you can expect to make some of your most memorable Fishing gains. But don’t take our word for it—head on over and give it a go! Gold member? 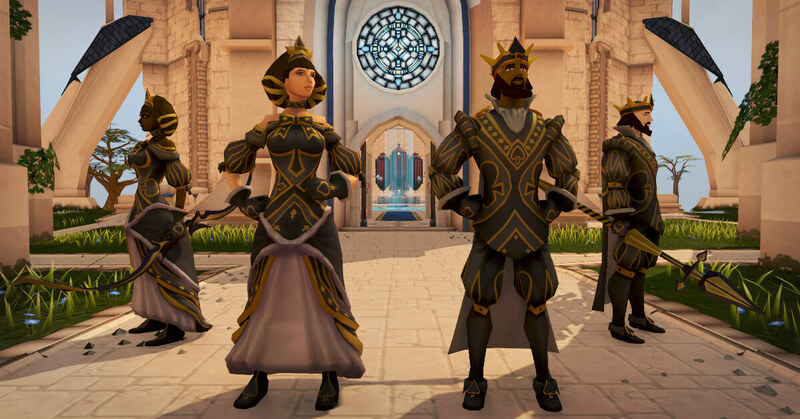 Enhance your training by heading to the Premier Club Vault portal outside the Grand Exchange to claim a bottled boost of your choice from the Guardian of the Vault! We want to get better at knowing what you think of our content and updates. Because of this, we're introducing Feedback Buttons: a new in-game tool that allows you to rate your current game session. You can access the new system via the top-right minimap logout button, or by pressing the ESC key. Try it out! More info here. On that note, we've also polished up the options menu. You can read up on those changes in the patch notes! You can find this week's patch notes here. To celebrate the release of the Clue Scroll Overhaul, the LootScape item for March is an additional Clue Scroll based on your level, with a small chance to upgrade any Elite Scroll received to a Master Scroll. Tasty! For more info on this week's upcoming community events and how to get involved, check out the Pink Skirts Events' thread.